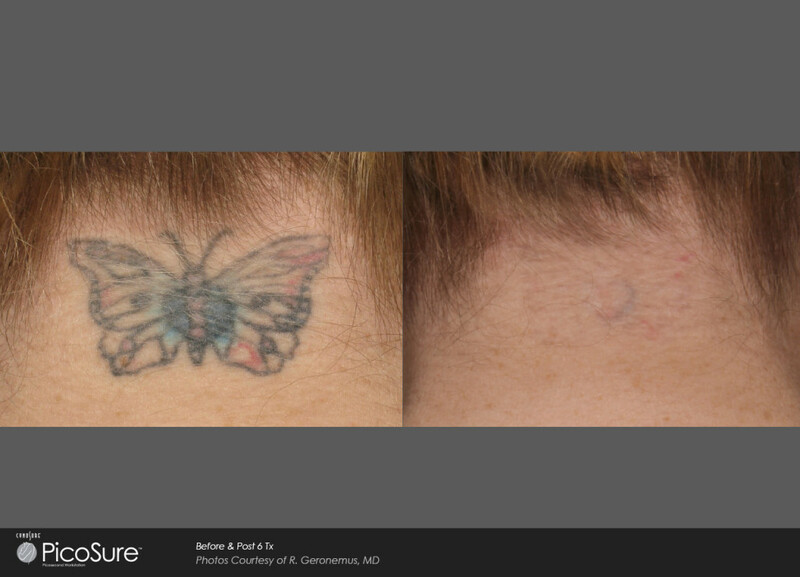 Maine Laser Clinic is the first practice in the state of Maine to offer the PicoSure™ tattoo removal system. This pioneering technology has changed the way tattoos are removed. Gone are the days of tough to remove colors like, green, blue, red, and yellow. 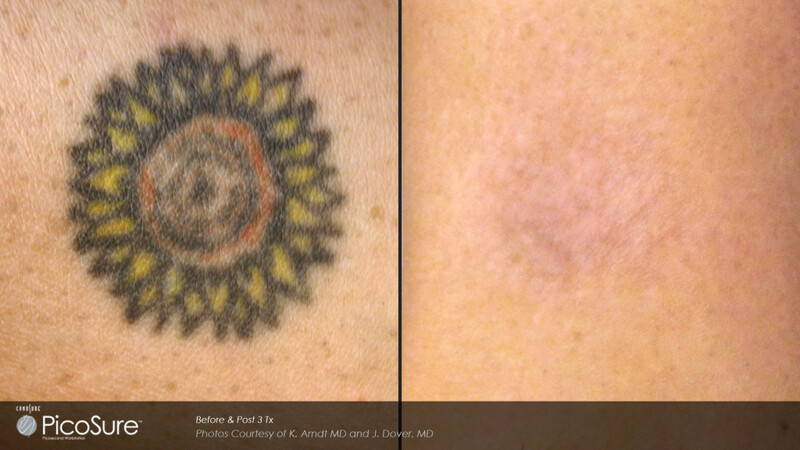 PicoSure™ is the world’s first picosecond laser designed for the removal of unwanted color heavy tattoos. With the addition of a picosecond laser, our clinic now has the ability to erase unwanted ink more effectively than ever before, especially the removal of difficult ink colors as well as previously treated tattoos. 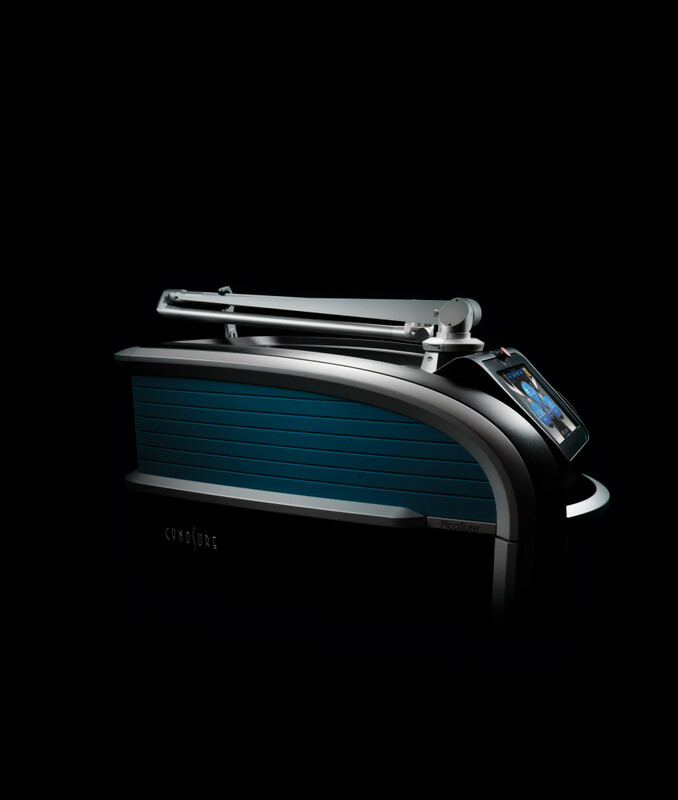 Additionally, this new technology promotes faster recovery time, as well as greater results with fewer treatments! My tattoo was treated with a Q-Switch laser in the past and didn’t clear, why would I try again now? For many years Q-Switched lasers were considered the gold standard for removing tattoos, that of course was until the launch of the PicoSure™ laser system in 2013. Practitioners were often left with using Q-Switched lasers that rely on thermal energy to heat and break apart tattoo ink. 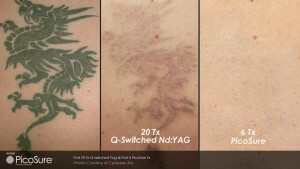 Picosecond technology (PicoSure™), utilizes ultra-short laser pulses to selectively target tattoo ink; the power generated by a PicoSure laser is so intense that ink is broken into minuscule dust-like particles, reducing treatment times in half! The ink particles are transformed into small fragments that the body can absorb and eliminate through the lymphatic system. The great thing about the PicoSure laser is it has been proven to successfully treat dark, resistant blue and green inks, as well as previously-treated, recalcitrant tattoos that were not successfully cleared in the past. I want to coverup my tattoo, can this be done? We hear this question a lot. Can my tattoo be lightened by the laser for a cover-up tattoo? One-third of our clients request to have their tattoo’s lightened with the goal of getting a more desirable tattoo. Emphatically the answer is YES!!! Tattoos can be lightened in preparation for a cover-up tattoo. In fact, your tattoo artist will be able to produce a much more clear and detailed version of whatever you decide to have redone. Does it cost more to have it removed? 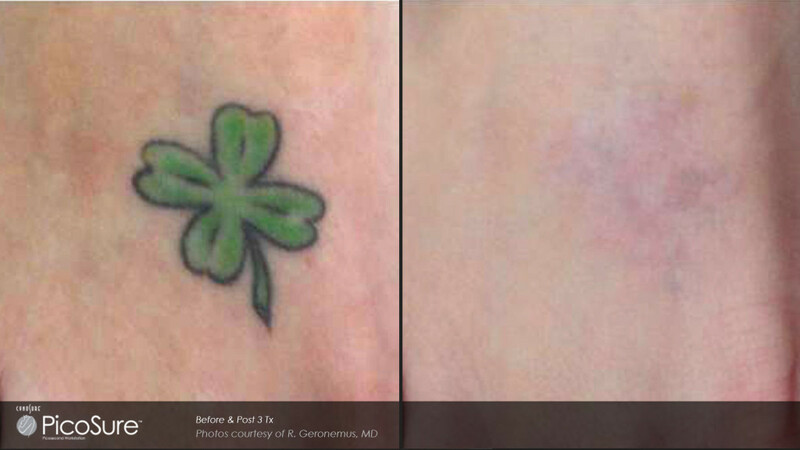 The decision to remove a tattoo; using any type of laser elicits anxiety for many people, and most often it’s cost that simply freaks people out. We do our best to estimate the amount of time it will take to successfully remove or fade any given tattoo. Please know the costs associated with the removal process are determined by several factors: including the size of tattoo, the location, and technology used to achieve a desired outcome. We offer flexible payment options and incentives to make the process as affordable as possible, but remember, we are REMOVING a permanent reminder of a poor choice, bad art, or traumatic memory. Sadly, insurance companies will not cover laser tattoo removal since it is considered an elective cosmetic procedure (check with your provider, some HSA’s allow for “flexible” spending). 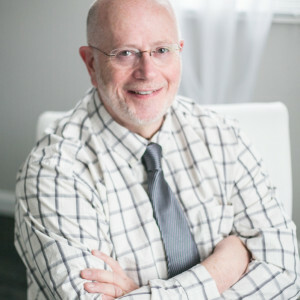 The great thing about our clinic is, we offer FREE consultations , at which point we determine and provide an estimate before you begin the removal process. How different is picosecond laser tattoo removal? The difference between the PicoSure™ laser and older Q-Switch lasers is like night-and-day. A picosecond laser delivers energy in the picosecond range; that is one trillionth, or one millionth of one millionth of a second, or 0.000 000 000 001 seconds, it’s incredibly fast! Whereas a Q-Switch laser delivers energy in the nanosecond range–which is fast, but not picosecond fast. Why is this important? Picosecond energy shatters ink particles into much smaller pieces making them easier for the body to remove. Think rocks vs grains of sand. 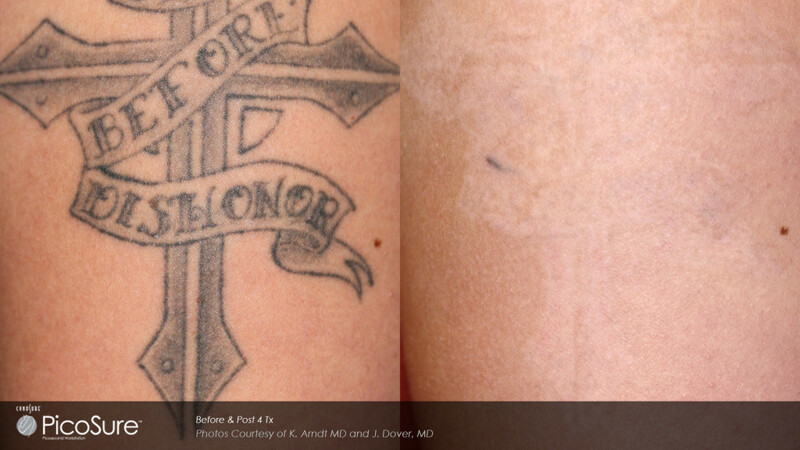 How do picosecond lasers work for tattoo removal? 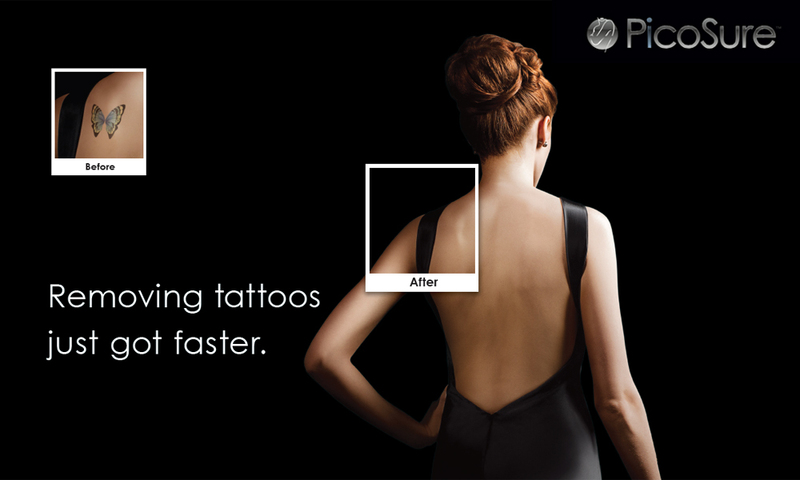 Picosecond lasers use photomechanical properties to shatter tattoo ink. The science behind this new technology capitalizes on ultrasonic pressure to shatter ink into smaller particles; allowing the body to remove ink more efficiently and effectively. Furthermore, the effects of picosecond technology minimizes the risks of overheating chromophores that can damage the surrounding tissue in the skin. It’s amazing technology to say the least. Does it feel different than a Q-Switch laser? This is a very good question, does tattoo removal hurt, and is the picosecond laser more painful? For many patients, the feeling of laser tattoo removal has been compared to what it feels like when getting a tattoo, however it is light years faster! We do our best to make you as comfortable as possible. We always use a cooling device to reduce as much discomfort as possible. Trust me, if it were too painful I would NEVER do it myself (Christopher May, LSO)! Will I require less treatments with the PiscoSure laser? Another great question, how many treatments will I need to remove my tattoo? As we mentioned before, many factors determine the amount of sessions required to reach a desired outcome. What type of ink was used? What size is your tattoo? Where is your tattoo located? These are all questions that need to be asked and answered to determine possible outcomes. Unfortunately, there is no magic number and no perfect tattoo. In fact, tattoos are imperfect in every way, but that’s a conversation better suited for your consultation. Did we mention consultations are FREE? How often can I come for treatment? We know you’d like to have these tattoos removed as quickly as possible, but your body needs time to process the ink once the laser shatters it to smithereens. Sadly, it often takes 4-8 weeks for the body to absorb the ink particles; every patient and tattoo responds differently. Food for thought: the body (internal) is a complex assortment of systems and micro-subsystems designed to do a variety of tasks. One of which is to work at an optimal pace, ensuring a harmonious environment for survival. In short order, the body needs time to remove those foreign bodies once they’re separated from the cellular portion of your skin. This is a very complex task, so patience and understanding is paramount to your well-being. It is critical to follow all recommended post treatment protocols, as they were developed to help increase successful removal, while reducing complications. What will my skin look like after a laser treatment? If you’ve come to this point, you may have also seen the “frosting” effect often associated with the tattoo removal process. The whitening that presents is a good indication of a perfect endpoint most laser practitioners seek. 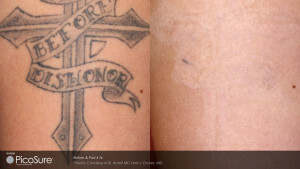 The ideal clinical endpoint for the tattoo treatment is an immediate slight whitening or “frosting” of the skin, however. This response subsides immediately after the treatment is complete. Rest assured, this whitening doesn’t last–quite often it’s gone within 10-15 minutes after a treatment. There are several visible signs associated with the result of a tattoo removal session; reddening, mild swelling, and tiny hemoglobin, pin-point bleeding. We provide clients with a full-set of aftercare instructions that outline how to keep your freshly treated tattoo clean and moist. We choose the PicoSure LASER because we wanted the most advanced tattoo removal platform in the industry…ensuring our clients received the best in class technology and performance.